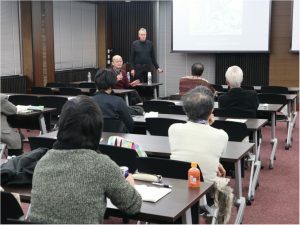 On December 15th, 2018, Prof. Erkki Huhtamo gave a lecture entitled, “Media, Motion and Transportation: An Archeological Research”, which was interpreted and moderated by Prof. Hiroshi Yoshioka at the Inamori Center. 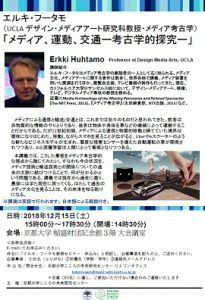 Prof. Huhtamo teaches design and media art at UCLA and is well-known as one of the founders of media archeology. The lecture began with an illustration from the 19th century depicting the composer Franz Schubert looking through a kaleidoscope, which was popular at that time. He is bumping into a man on a bicycle without pedals, which was also popular at that time. 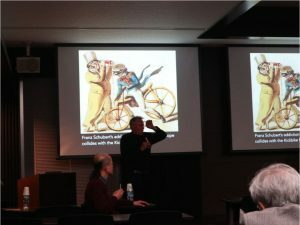 The illustration is from 200 years ago, yet similar scenes can be seen on university campuses in California if the kaleidoscope is replaced with a smartphone and the bicycle with an “eScooter”, which is controversial. “Media archeology” is a very interesting study in which, for instance, the fact that a certain relationship between media and humans is not as new as we assume it to be. Media archeology is supported by historical facts and shows how the relationships date back to old origins. 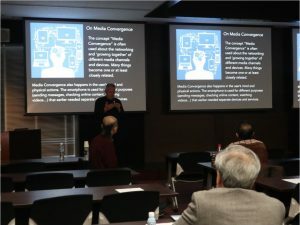 The theme of the lecture was the relationship between media and transportation. Media devices, such as TVs and computers, used to be placed in specific locations. However, this is a golden age of mobile devices in which they have become smaller and more mobile. Using smartphones, Uber emerged as a new means of transportation. 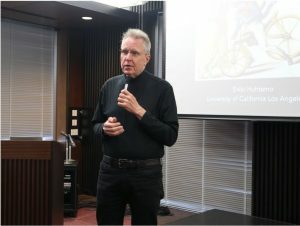 Prof. Huhtamo discussed eSchooters and automated driving taxis that resemble large flying drones. Automated taxis are still at an experimental stage, but eScooters are becoming very popular among young people in the US. The eScooter share is on the rise because of its convenience and ecology. However, they have problematic sides as well: parked scooters obstruct traffic and there have been accidents. Japan has not yet introduced the system. Some of the related issues are similar to those that emerged with automated driving. We will face various issues concerning the future of media and transportation. 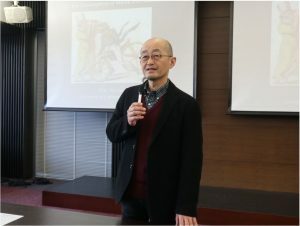 The audience included students, researchers and members of the general public. 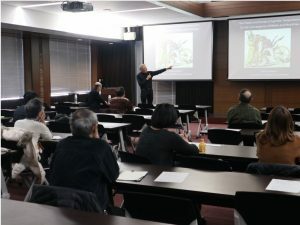 Some of the questions were “Can eSchooters be carried onto buses and trains?”, “What is the origin of the term ‘last mile’?”, “How would you make use of past research?” and “Can new technology make people happy?”. The participants had an active exchange of questions and answers with Prof. Huhtamo.